The mature pericarp of Zanthoxylum schinifolium Sieb. et Zucc. or Z. bungeanum Maxim. of family Rutaceae. Many areas in China, but the one at best quality grows in Sichuan province, and is also named as Chuan Jiao, Shu Jiao. The Qing Jiao (Zanthoxylum schinifolium Sieb. et Zucc) is fragrant, pungent and slightly sweet in flavor; the Z. bungeanum Maxim has thicker fragrance, and constantly numbs the tongue. Dry, red, without peduncle and stone. Pungent, warm; spleen, stomach and kidney meridians entered. Warm middle energizer and alleviate pain, expel ascaris for oral use; dry dampness, kill worms and relieve itch for external use. It has the actions of warming middle energizer and drying dampness, dispersing cold to alleviate pain. 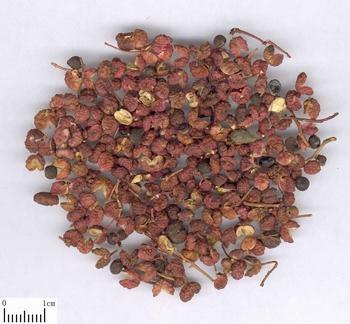 For stomach cold, abdominal pain and vomiting due to invasion of exogenous cold, it is combined with the middle-energizer-warming, cold-dispersing and vomiting-arresting herbs such as Sheng Jiang and Rou Dou Kou. For gastroabdominal cold pain, vomiting and poor appetite due to deficiency-cold of spleen-stomach, it is usually combined with the middle-energizer-warming and spleen-invigorating herbs. For instance it is combined with Ren Shen and Gan Jiang in Da Jian Zhong Tang from Jin Kui Yao Lue. For diarrhea due to damp-cold type, it is combined with the middle-energizer-warming, intestine-astringing and diarrhea-checking herbs. For instance it is combined with Rou Dou Kou in Chuan Jiao Wan from Xiao Er Wei Sheng Zong Wei Lun Fang (Complete Book of Pediatrics). It has the actions of expelling ascaris and killing parasites. For abdominal pain due to helminthic accumulation, coldness of extremities, restlessness and vomiting ascaris, it is usually combined with the middle-energizer-warming and heat-clearing herbs. For instance it is combined with Wu Mei, Gan Jiang and Huang Bai in Wu Mei Wan from Shang Han Lun. For infantile oxyuriasis with perianal pruritus, it can be decocted alone for retention enema. It has the actions of drying dampness, killing worms and relieving itching for external use. For pruritus vulvae, it can be decocted with Wu Zhu Yu and She Chuang Zi for washing. For instance they are used in Jiao Zhu Tang from Yi Ji. For eczema, it can be decocted alone or with other herbs such as Ku Shen, She Chuang Zi, Di Fu Zi and Huang Bai for washing. Decoct 3～6 g for oral use; decoct proper dosage for external application.